I’m finally getting a chance to write about our second week of Fun and Adventure. And what a week its been!!! Just like the first week, its been fast action Adventure Fun from dawn to dusk too!!! Non Stop fast Action Fun!!! Been so busy adventuring and running double session camps that I can’t seem to ever get a chance to sit down for a bit and write my blog! So todays the Day! And just like last week, I had two great groups of kids, perfect weather all week long and non stop fun and excitement like there was no tomorrow!!! From one group to the next, its been a Blast! As soon as I would drop off the first group, the second would arrive and off we’d go again, looking for adventure and creating our own!!! Just the way I love it!!! For this week, the tides were low incoming in the morning and high out going in the afternoon. 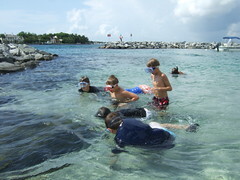 Sometime each day we would visit the Rock Garden to go snorkeling and the Big Sandbar to go exploring. Everyone of us had a chance to explore and discover new things. And explore and discover new things, We Did! 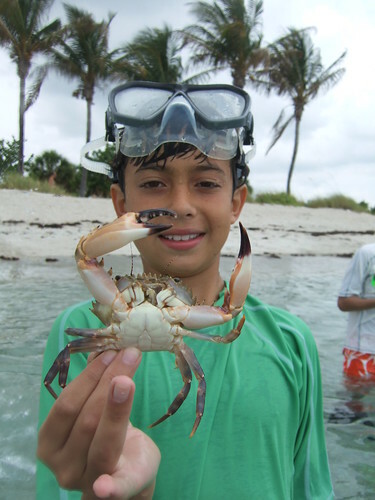 From manatees, sea turtles and Giant Barracudas, to horseshoe crabs, spider crabs, squat lobster and more! It was a Great Week, and one thing for sure, we kept busy non-stop!!! What a week it was!!! We spent a few hours everyday exploring the Rock Garden. And as Usual, there were fish everywhere to be seen! 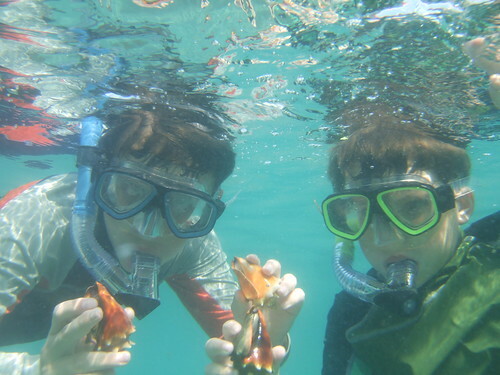 We had so much fun snorkeling, observing and chasing fish, looking under rocks catching all sorts of different species of crabs, finding sea cucumbers, conchs and shrimp. You name it, we found it, and of course we tried to catch it just for FUN! Sometimes we did, sometimes we didn’t but it was just GREAT all the same!!! 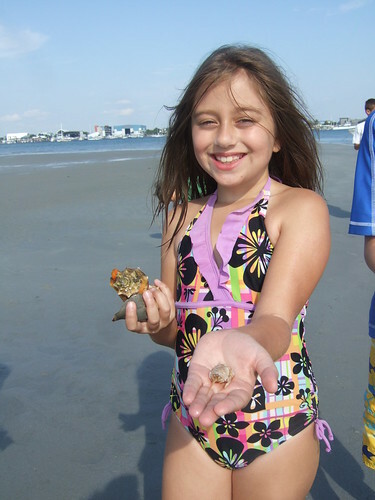 AdventureMichael and Gabrielle spent a good bit of time finding fighting conchs by the hundreds. In no time at all they collected them by the handfuls! They were everywhere to be found! They literally covered the bottom! Most were West Indian fighting conchs and a few others were Florida fighting conchs. The West Indian species can be identified by having dark reddish brown to purple interiors while the Florida species has an orange to almost bright red interior and a little more knobby around the spire. 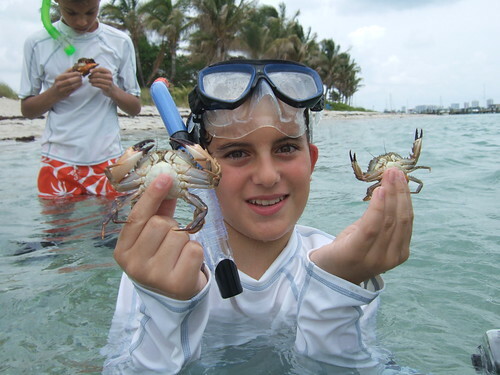 AdventureAJ spent a good bit of time searching for swimming crabs under rocks and collecting star eye hermit crabs by the dozens! 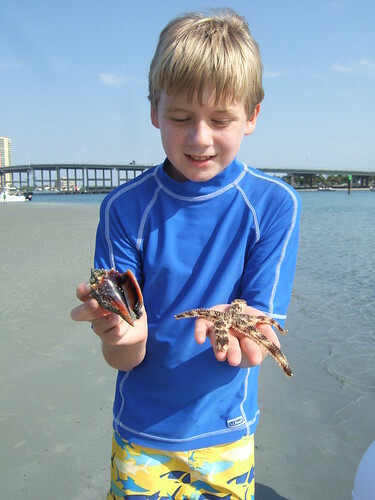 Most were living in the empty shells of fighting conchs that were strewn along the bottom. A bit later, AdventureMichael gave a hand and in no time at all they came up with some nice and impressive swimming crabs for all to see! Nice job guys!!! Didn’t get pinched either! Way to go!!! 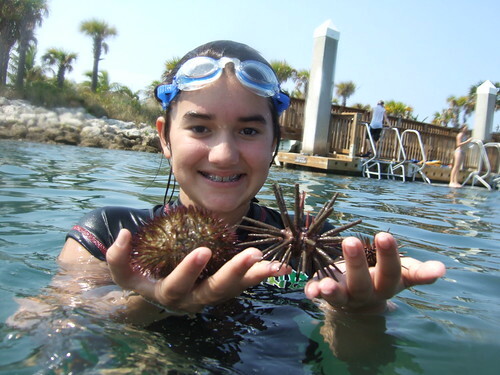 Another day while we explored the lagoon on Peanut Island, AdventureJulia found 3 different species of sea urchins that she collected to show and share with us. 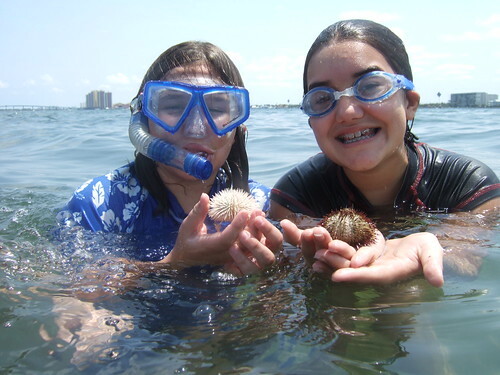 The one she liked best was a nice big slate-pencil urchin that she found stuck between two rocks. It was using its stout spines like anchors to wedge itself in place. Another was a smaller reef urchin feeding on the algae covering the rocks and the most common of all was the variegated sea urchin that she found by the dozens! By the end of the week at the Rock Garden we had schools of parrotfish following us, hoping to steal our swimming crabs, rock crabs and juvenile blue crabs for a meal! 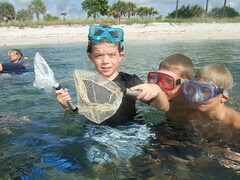 We had 3 big sheephead following us too and they wanted to steal our crabs as well. I think they were beginning to recognise us! The second we got in, here they came! Just as if we rang the dinner bell!!! All of us thought that was Cool! AdventureEthan came up with a swimming crab with giant pinchers that was so big even the sheephead thought better than try to eat this one, claws and all!!! 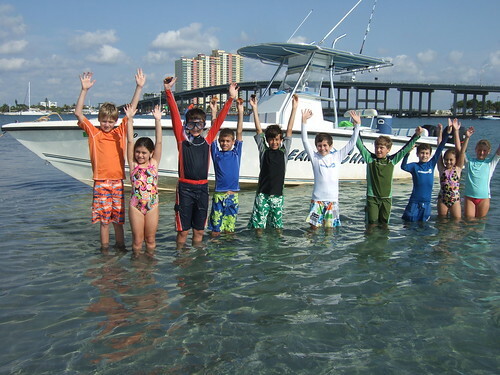 One day at the Big Sandbar we stopped by to do a bit of exploring and snorkeling and found hundreds of fighting conchs along the north edge of the bar. They were so thick along the bottom you couldn’t put your foot down without almost stepping on one. In some places they were so concentrated you almost couldn’t see sand between them! It was a great discovery and we all loved that!!! 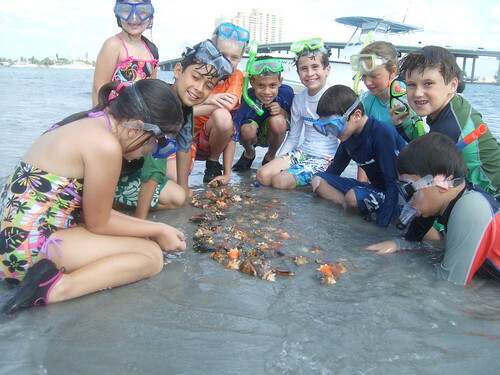 The kids collected a few dozen, placed them in one big pile and nick-named it “Conch City”. And I had to agree, it looked like a ‘conch city” to me! We spent a bit of time exploring around the sandbar and found numerous beaded starfish, juvenile blue crabs, found tons of mantis shrimp holes with even a few shy, beady-eyed mantis shrimp peeking out to look at us! We always love seeing that! This is the only creature I know of in the marine environment that has 360 degree vision, and they are darn smart and wary too!!! I thought one of the coolest finds at the sandbar was a banded sea star that we found just popping out of the sand! AdventureHunter shows us his find! It was the very first one I’ve seen here. And a nice find it was!!! Another day, while exploring the Big Sandbar, we found dozens of juvenile queen conchs and watched as the congregation of fighting conchs we found earlier in the week, were laying eggs. They would seemingly glue long strings of eggs to grains of sand, and somehow roll them into tight round balls. It was a cool thing to watch as hundreds of conchs were laying eggs all at the same time! 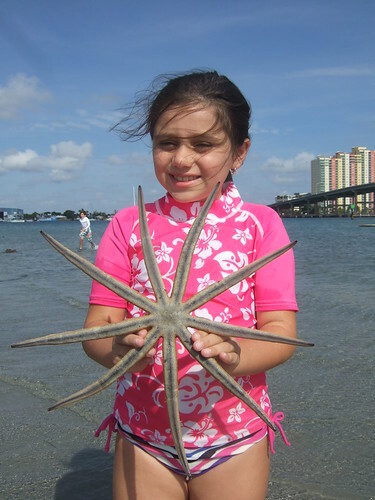 One of the neatest things AdventureStella found this day was an extremely large 9 armed starfish that seemed to be about half her size! Way to go Stella! Later that day we walked over to another sandbar that was exposed to the west of us and found dozens of netted olive shells burrowing tunnels thru the sand and about a half dozen juvenile box crabs that were crawling back to deeper water. We didn’t find as many fighting conchs on this sandbar, and we thought it was neat how they somehow ‘knew” to congregate all in the same place at the same time! I guess released pheromones plays a big part in that. Another cool thing we found on this sandbar that we didn’t on the other, was dozens of squat lobsters just beginning to burrow out of the sand. I could tell AdventureAmanda sure loved finding this one! On the round about way back to the boat we stopped to explore and snorkle around an old sunken boat in about 4 feet of water. It was surrounded by thousands of menhaden in a tight school, swimming seemingly endless circles around the boat. We found a couple of arrow crabs clinging to the barnacle covered sides. 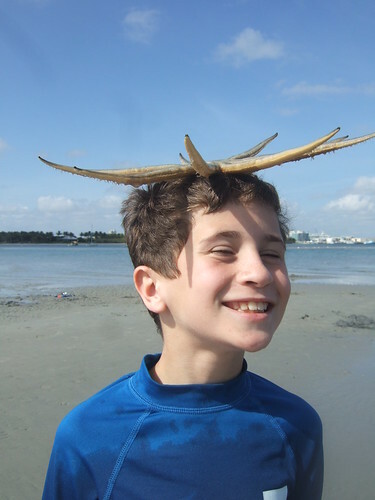 While we were scuffling our feet along the bottom, AdventureNicholas came up with a nice 9 armed starfish that seemed to fit perfectly right on his head! Another nice find! 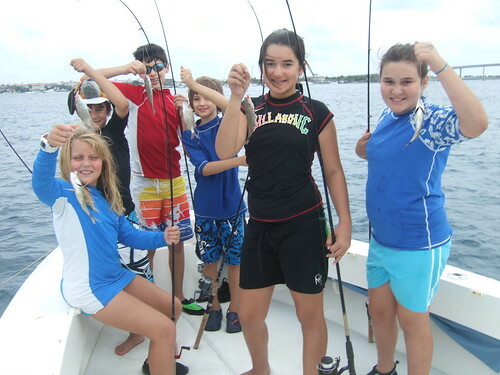 Thursday was our fishing day, and as usual, everyone caught fish one after another!! 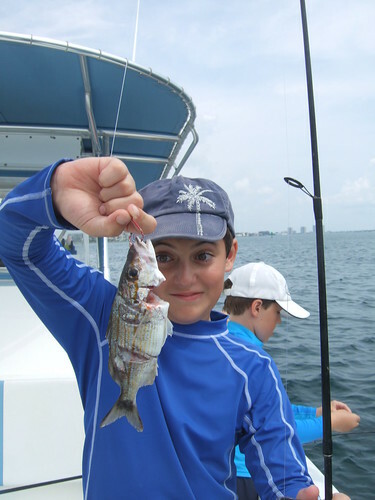 Tomtates, sailors choice, pigfish, porkfish, pinfish, porgies. margates, lane snappers and more! You name it, I think we caught it!!! Fish after fish after fish!!! All day long!!! Just the way it always is!!! More often than not, everyone had a fish on, all at the same time!!! And I certainly was running behind taking fish off on that day!!! While fishing the artificial reef during the morning session, we had so many fish coming in one after another, we attracted a hungry barracuda that decided to hunker down right under the boat and have a few of our fish for lunch! It wasn’t long before we started to lose our fish to that toothy critter! An especially exciting moment occurred for AdventureMichael when one of his tomtates came up partially filletted before reaching the boat! Way to go Cuda! During the afternoon session we started out fishing the artificial reef and caught the typical grunts, snappers and tomtates by the hundreds. Nothing of any size though. We just couldn’t seem to get our baits past the schools of smaller fish hovering over the reef by the thousands. 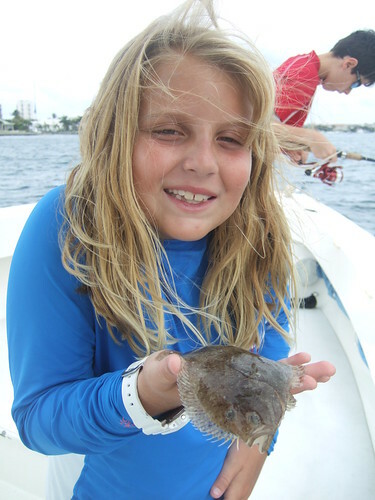 A few times we threw our lines out away from the rocks and the reef and came up with some flounder that the group loved catching! Not the typical fish you usually catch in the summer time. 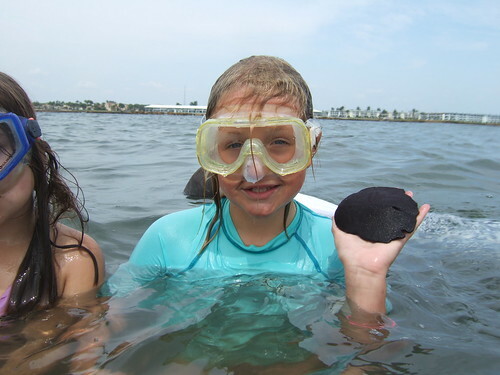 We seem to catch the bigger flounder during our Christmas and Holiday Camp sessions and sometimes early in the Spring sessions too. either way though we had FUN catching these! I know AdventureBella sure did! From here I decided to move to my secret lane snapper hole where the action is not as fast and furious, but sometimes you get some decent size fish. Little did I know then how BIG the next fish was going to be!!! And today was going to set the new standard for the BIGGEST FISH caught and boated at any of AdventureMike’s Camps!!! On the lightest tackle no less!!! We no sooner pulled up to the spot, dropped anchor, let the lines down and WHAMMO!!! AdventureDylan hooks a BIG Lane Snapper! 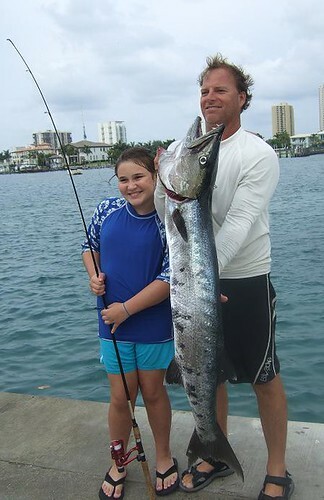 As she is reeling that fish in on 6 lb test ultra-lite spinning tackle, some Monstrous Barracuda decides to have it for lunch and eats it 6 inches rom the side of the boat!!! The drag on the reel screams out, stops for a second, then the rod bends double and the reel screams again!!! I thought it was never going to stop!!! AdventureDylan fights like a champ, long and hard till she has nothing left! Finally, with the rod bent straight by the weight of the Big Fish, she begs me to take the rod before it is pulled from her hands!!! A half hour later we boat this HUGE barracuda that was foul hooked under the belly by the # 2 circle hook when it pulled from the snappers mouth!!! Another day we spent snorkeling around Sea Urchin Shoals and found so many variegated and short spined sea urchins you couldn’t keep count. They came in a variety of colors, from snow white to dark green, brilliant purple to light pink. Just about every color combination you could think of!!! It was great and we had so much fun collecting them all and checking them out. It didn’t take Adventure Dylan and Julia long to find the colors they liked! 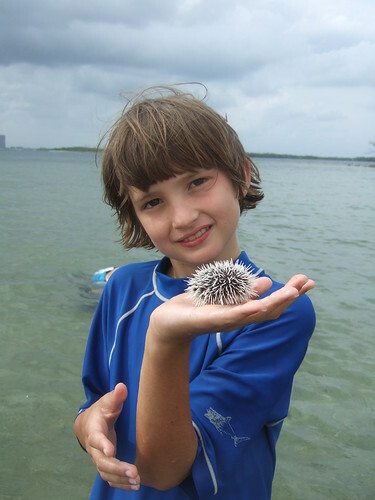 AdventureBeau spent some time searching the shallow sea grass beds looking for a much more rare or uncommon sea urchin called a West Indian Sea Egg. They are not real easy to find and I am always looking myself. They are round and black, have very short spines and seemed to have tiny tube feet by the thousands! When held under water in the palm of your hand, those tiny tube feet will grasp ahold and firmly attach themselves to your hand like they belong there! Every kid loves when it happens to them! I know I sure did when I was a kid too! Nice find Beau! A short while after this AdventureDylan spots a giant spider crab crawling thru the sea grass beds and gives chase! After numerous squeals of laughter, excitement and/or sheer terror; or maybe all the above, she comes up holding this beauty just the way she’s supposed to without getting pinched! Way to go Dylan!!! 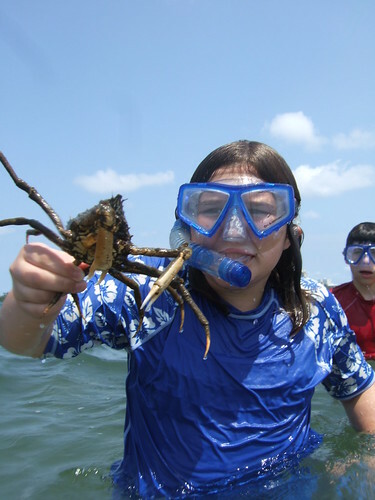 That’s one nice, big, thorny spider crab!!! And you still have all your fingers!! Alright!!! From here we mosied over to Little Munyon Island and swam around the island to see what we could discover. 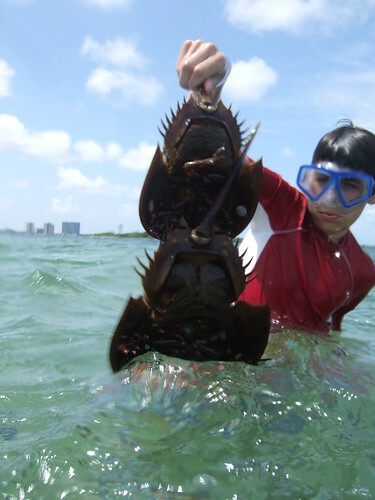 We all found some really cool things but adventureNeil took the cake when he yelled, “horseshoe crabs, horseshoe crabs” and a split second later came up holding a pair by the tail! They are actually related to spiders and components in their blood are synthesized and used in medicine to make blood thinners and anti-coagulants for heart attack and stroke victims. How cool is that, that your very life could be saved by this amazing creature!!! It was a great find! Nice Job Neil! 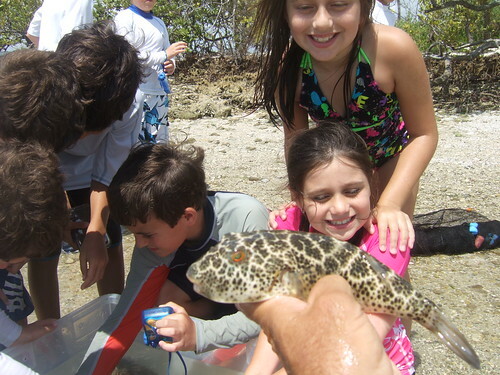 Another day while we were snorkeling at Little Munyon Island, searching around the mangrove roots and rocky shoreline to see what we could find, I heard adventureDylan yell, ” A pufferfish, a pufferfish!” and I swam over to take a look. Sure enough, AdventureDylan had found a cute striped burrfish that was lying motionless on the bottom, half hidden amongst the weeds. I’m sure it thought its camoflauge good enough to fool even the most diligent hunter. But not good enough to fool AdventureDylan!!! She seemed to be finding just about everything I could think of lately! You’ve come a long way since that very first year you came to my camp! way to Go!!! Another Great find!!! A short time later AdventureJulia and Bella came up with a pair of horseshoe crabs on their own and we all took turns checking those horseshoe crabs out up close and personal as well. I always wish we would be able to find these wondrous creatures everytime we come here and lately, luck has been on our side! Hopefully this species is making a comeback around the lake worth lagoon, or maybe we are just getting luckier or better at finding them. Either way I love it! Nice job Girls!!! Way to Go!!! During one of the morning sessions, we stopped by Starfish Prairie to search for some large cushion starfish commonly found here. It is about a 200 yard wide, shallow rocky bottom, full of short spined sea urchins, fern-like Calerpa algae and a few sandy patches full of small clams. Just right for keeping a Cushion Starfish happy and well fed! Needless to say, we found quite a few, but one of the coolest things we discovered while searching for starfish was a sandy patch full of some large live sandollars that I have never found here before! It was a great discovery! I know AdventureJackie thought so! 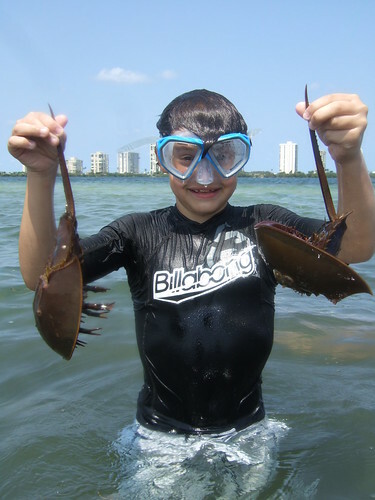 On the way back to the boat, I heard AdventureChase yelling he’s found some horseshoe crabs too and after a few squeals of laughter, he came up with a big smile on his face, and a horseshoe crab in each hand! Way to go Chase!!! 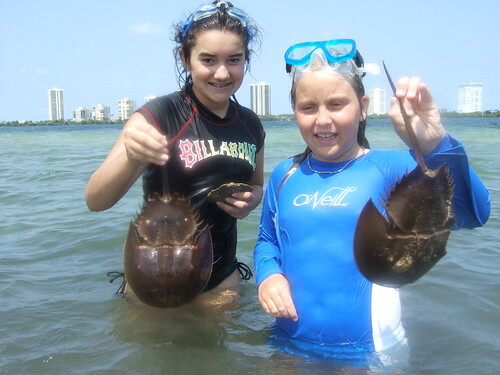 I think we found more horseshoe crabs this week than what we found in total all last year! Hope it last all summer! Wouldn’t that be GREAT!!! One afternoon we spent an hour doing a bit of seine netting in the shallow grass beds but the tide was so high we didn’t have any real beach to pull the net up on to. Usually we come up with hundreds of juvenile fish and a variety of shrimp and crabs but today the grass beds were too deep to do any successful seining. We had a blast all the same and it was fun for each child to give it a try! 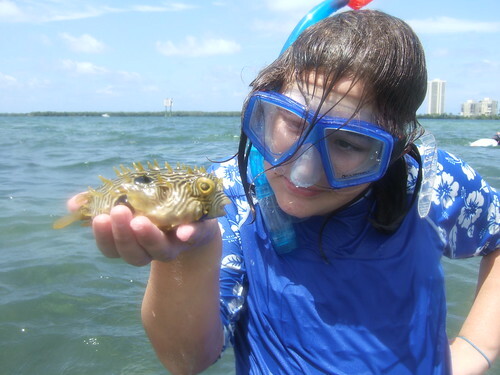 We did catch a couple of checkered pufferfish which have to be one of the most favorite fish the kids like to catch, along with a few pipefish, mojarras, needlefish and a few juvenile grunts and snapper. All pufferfish are capable of giving one a good bite if you don’t hold them properly. Make sure to keep your fingers away from their mouths! Once inflated, they are easily held but since I couldn’t get this one to stay “puffed up” I held him myself to show the kids. They seemed to love it all the same! 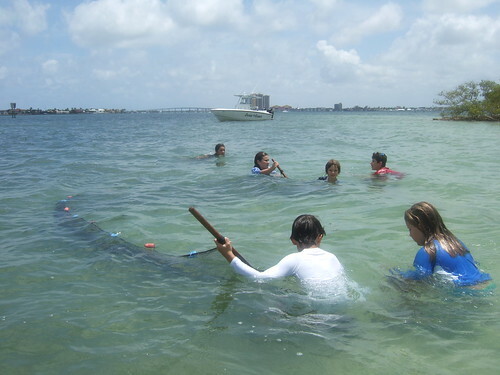 One morning I took the group to look for juvenile and sub-adult sea turtles that I had observed a few weeks earlier feeding on the shallow sea grass just to the west of Singer Island. I carefully motored in to shallow water and shut off the engines to drift. We spent a few minutes observing and counting all the different turtles we saw coming up to breathe. We spotted 19 different turtles in the first 15 minutes! What a day, and shortly after that it got even BETTER!!! While we were sitting quietly observing the turtles, 2 manatees came slowly swimming along, spotted the boat, and swam directly towards us. 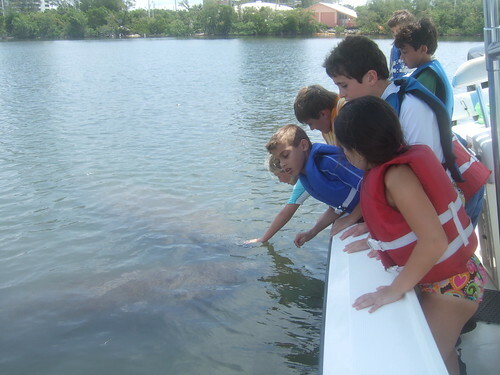 A few of the kids put their hands in the water and the manatees came over and began nuzzling their hands like they were long lost friends! It was a wonderful encounter for all of us!!! 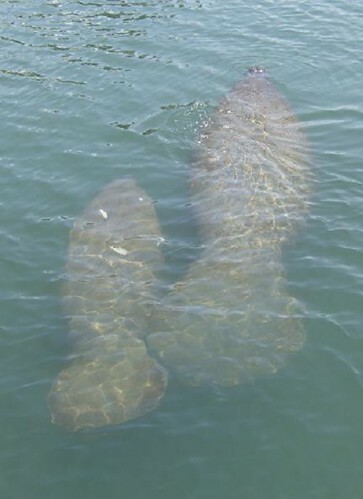 For the next 2 hours those manatees never left the side of the boat. They would lie right up against the boat and roll back and forth along the side, seemingly using our boat as a scratching pad. Of course the kids loved this!! !, and so did the manatees!!! 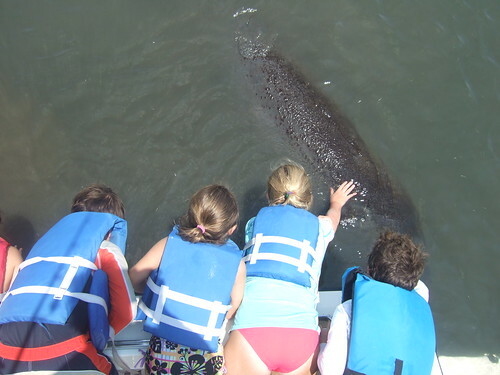 Every now and then some of the gang would gently reach over the side and give one of the manatees a scratch on the back. They would arch their backs out of water as if to say, “Please scratch me some more”, and not move an inch while they were being scratched. 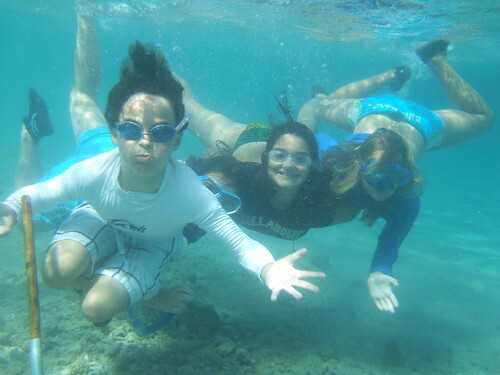 Maybe they thought we were some giant cleaner fish, who knows, but the kids were having the time of their lives and so was I !!! It was just GREAT!!! Sometime later, as the water level got deeper, the manatees sauntered off a few feet and began eating sea grass like we weren’t even there. The would lift their heads out of water with mouths full of weeds, shake back and forth, and gobble it down. Mouthful after mouthful after mouthful! What a site to see!!! It was absolutely fabulous!! We felt so lucky to have had the opportunity to experience this! I’m sure the kids will never forget it! I know I won’t!!! What a wonderful day!!! A short while later they swam off as a pair and disappeared into deeper water. We loved every minute of it!!! All in all, it was an incredible week for all of us!! An Adventure we soon won’t forget!!! We had so much FUN, so much ADVENTURE!!! 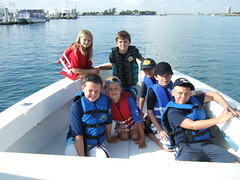 And the kids were just Great!!! 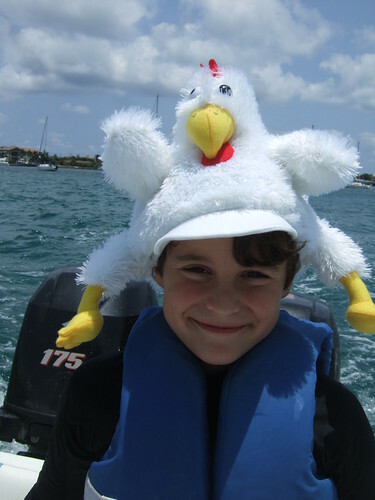 Even when some come wearing “chicken hats” , which I loved by the way!! !, I’m sad to see them leave!!! Of course all this FUN has left me looking forward to this up coming week. A new Adventure to be shared with an exciting new group of Adventurers. Who knows what we may discover, but one things certain, We Are Going To Have Some FUN!!! Stay tuned, and see what the next week brings!!! Could things possibly get any better??? Hope you’ll join us!!! I’m going to give it my best!! !